Directions for cooking meat usually state the time of cooking in terms of minutes per pound. At best this can only serve as a guide, for several factors may cause variation in the length of time required to cook a piece of meat. The only way of knowing when the interior of a piece of meat has reached a definite temperature and thus a definite stage of cookery is to insert something in the center of the meat by which the interior temperature may be read. For this purpose a thermometer or a thermocouple may be used. The easiest method for household use is the insertion of a thermometer into the meat. Two types of thermometers may be used: a right-angled thermometer with the temperature scale on the horizontal arm (see Fig. 23); or a very short tube-type thermometer about 6 or 8 inches long with the temperature scale on the upper half. The latter must be short to keep the top from touching the upper part of the oven, particularly the small gas ovens and many electric ovens. Thus the graduated scale is condensed, which makes it more difficult to read. The short thermometer is preferable for small roasts of meat and for meat with soft fibers. The right-angled thermometer is suitable for beef roasts, ham, leg of veal, and lamb. It is convenient for taking temperatures of custards, cakes, and other foods, for it can be supported by the horizontal arm from a shelf in the oven. The following factors affect the time required to cook meat. (1) The cooking temperature. (2) Weight. Surface area. The shortest distance to the center of the thickest portion of the meat. (3) The stage to which the meat is cooked - rare, or well done. (4) The composition of the meat. (5) The degree of ripeness. The cooking temperature. The higher the cooking temperature the more rapidly will a piece of meat reach a definite temperature, for with a higher temperature at the surface, the more rapidly heat will penetrate to the interior of the meat. As oven temperatures during the cooking of meat may vary many degrees, this factor causes a wide variation in the time required for cooking meat. Fig. 25. - To illustrate heat penetration in roasts and to show that the diameter does not increase in the same ratio as the weight. Weight. Surface area. Shortest distance to thickest portion of the meat. The time for cooking meat is often expressed in minutes per pound, but it is also a well-known fact that a heavy piece of meat of the same shape as one of light weight will require a shorter time per pound for cooking if the oven temperatures are the same. The reason for this can best be explained with the aid of a diagram. Suppose a cube 1 inch square weighs 1 ounce. It contains 6 square inches of surface area (see Fig. 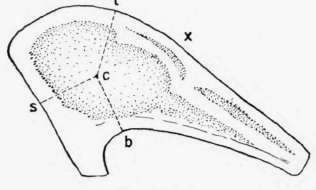 25, diagram A), and the distance from the sides to the center (s - c in the figure) is 1/2 inch. 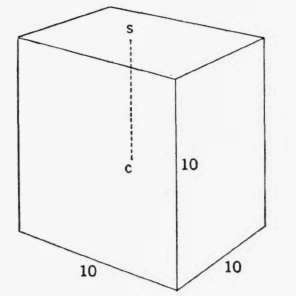 If the cube is enlarged to 10 times its original size, diagram B, its weight is increased to 1000 ounces, its surface to 600 square inches or 100 times its original surface area, and the distance (s - c) to the center is 5 inches, or 10 times the distance of cube A. In other words, the distance to the center does not increase in the same ratio as the surface area and the weight. In heating these cubes, if the heat travels through the material at a uniform rate it will not take 1000 times as long to bring the center of cube B to a definite temperature as cube A, but 10 times as long. The diameter of a sphere or a cylinder does not increase in the same proportion as the surface area and weight. A piece of meat is not shaped like a cube, but some are cylindrical, and in roasts of similar shape the weight increases more rapidly than the distance that the heat must penetrate. Rolled roasts are cylindrical in shape. 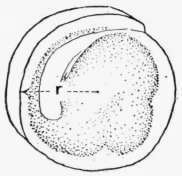 Here the length of the radius (r) determines the time for the heat to penetrate to the center of the roast, unless the length of the cylinder is shorter than its diameter. See Fig. 25, diagram C.
In a standing rib roast, Fig. 25, diagram D, it is not the distance to the center of the meat, which may be somewhere near the portion marked x, but the distance through the thick portion of the meat, which affects the time required for cooking. The heat travels in from the top along the line tc, from the side along the line sc, and from the bottom along the line be. Ham, leg of lamb, and leg of veal have the thickest portion of the meat nearer one end than the center of the meat. It is obvious from the diagrams that the shorter the distance to the center of the piece of meat the more rapidly the heat will penetrate; the longer the distance, the more time will be required. Weight and surface area are not satisfactory to determine cooking time, for the size of the piece and its shape determine the distance to the thickest part of the meat. A thin, wide roast will cook in less time and a thick compact one will take a longer time. The following examples illustrate this. A standing rib roast weighing 11.6 pounds required 1 hour and 52 minutes to reach an inner temperature of 57°C, when cooked for 20 minutes at 275°C. and for the remainder of the cooking period at 125°C. This gives an average of 9.3 minutes per pound. Another roast weighing 11.5 pounds and with the same cooking conditions required 3 hours and 43 minutes, averaging 19.3 minutes per pound. The first roast consisted of five ribs and was thin and wide; the latter consisted of three ribs and was thick and compact. If roasts are always of the same shape and the same cooking temperature is always used the time for cooking can be estimated more accurately than when the shape of the roast varies. A large piece of meat cooks in a shorter time per pound than a small one if all other conditions are standardized. Smaller hams and legs of lamb require more minutes per pound than larger ones. The same is true of poultry, smaller chickens and turkeys requiring more minutes per pound than larger ones. Time per pound. Minutes per pound for some roasts are given in Tables 29 and 30, but if not taken in connection with cooking temperatures, size, and the stage of cookery, they are worth very little for a guide in cooking meat. Most of the roasts given in these tables were transferred to a second oven after searing instead of lowering the temperature of the oven in which the roast was seared. This gives a slightly longer time per pound. There may be considerable variation in the time per pound as can be seen in Table 29. In general, the time per pound is longer with the smaller roasts. With a very thin roast the thickness of the slice influences the rate of heat penetration more than the other dimensions or its weight.